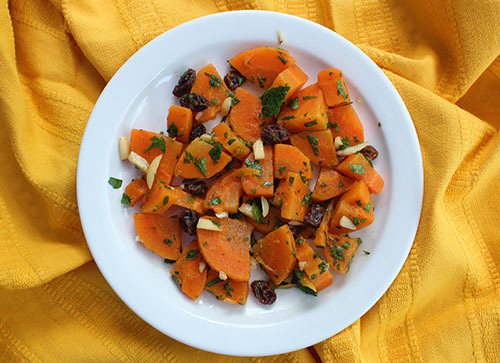 Brighten up your dinner table with this flavorful and vibrant side dish! With carrots as the star ingredient, this salad is full of color and crunch. Carrots also provide Vitamin A, essential for eye health, and Vitamin C, for immune health. Play with the spices to add more of a kick if you prefer spicier foods. Add chopped carrots and cook until just tender, about 5-10 minutes. Drain carrots and rinse immediately under cold water. Combine minced garlic, salt, lemon juice, olive oil, cumin, cinnamon, and cayenne. Add the above dressing to carrots and mix well. Toss in raisins, slivered almonds, and parsley.